Tweet Walter Trout is the legendary blues/rock guitarist who has a new album out called “Blues for the Modern Daze.” It’s a killer rock album; if you’re into bluesy rock then I think you should checkout the album. Listening to the album was like listening to a live performance, which makes me that much more excited to see him on his upcoming tour. Check out the interview below…you can also listen to it here. Zoiks! : Your new album Blues for the Modern Day comes out April 24th followed by a country wide tour to support the album. How do you prepare for the release of an album and an extensive tour like that? 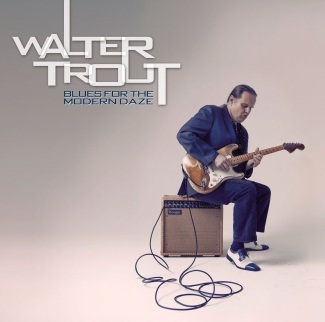 Walter Trout: Well if I want to be honest about it, right now I’m laying on the couch, just had a double espresso. But, you know, I tour so much, to be honest I do 200 cities a year every year for the last 22 years with my band, and if I have a little down time like now, I’ve been home for 2 or 3 weeks, I don’t really do much of anything except hang with my wife and kids, and like I say I’m sitting on the couch watching a little TV and I recharge, and I’m gonna do some local shows next weekend, I’m gonna do 4 shows here in California, and then I’m off for basically 4 or 5 months of touring so right now I am barely moving you know? Z: When you’re on the road, what is your routine like? Is it pretty much very scheduled and very strict or is it more you can take your time? WT: Oh there’s no, we, like I just did the Europe tour. I was there I think 32 days and I did 30 cities, and on the two days that I did not play, those were days where we drove from the middle of France or the middle of Belgium out into the middle of England, so that was a full day drive, and then we drove from Scotland to Holland on the other day, so other than the fact that I had a thousand mile drive on both of those days, I played every night. You get up, you get into the vehicle, you go to the next city and you set up and you play. It’s a pretty strict regiment. At my age you can’t be out there approaching it like young guys where you’re 20 years old and drinking and partying staying up all night chasing girls and stuff, you can’t do that when you’re 61. You have to try to get some sleep and try to eat some decent food and take care of yourself otherwise you will just physically self destruct you know? WT: Yeah I do actually. Sometimes somebody will walk up to me and say will you sign my cd covers and I go ‘yeah,’ and they hand me this stack, and I look at it and I go god did I do all this? How did this happen because it just seemed to happen overnight. I was in John Mayall’s band, I got offered a record deal, and I went for the record deal and it’s like all of a sudden, I feel like in a certain way I sort of blinked my eyes and here’s album number 21, but it’s because I work all the time. I don’t really take much time off. I do an album almost every year, and then I tour the rest of the year to promote it. So it’s going by very quickly I have to say. Z: What can your fans expect from this new album? WT: Well I think it is probably the closest studio approximation of the energy that we put out live that you’re gonna get. People keep coming to my live shows because I think they get something from the live shows that they don’t get from the studio stuff, and I think that’s the energy and the aggression, and I think this is about as close to that as they’re gonna get for a studio recording. I just took my band in there and we played the stuff, a lot of it we played it live, so it’s a pretty good representation of what my band does. Z: I’ve heard the new album, I’ve listened to it several times and I feel like I’m listening to a live concert. It’s something I feel is missing in a lot of music today. That’s important to you – what’s the trick? Just playing live in the studio or is there more to it? WT: Well, you know, a lot of guys these days, even guys in my genre, they record in a way where they go in and the bass player and the drummer record their part and then a keyboard player comes in a week later and puts a part on there, then 4 days later they add a rhythm guitar and they do all this layering stuff. I’m a big believer in this kind of music, one of the important elements is the chemistry between the players, and the only way you’re gonna capture that is by having the players just go in and look at each other. We set up in a semi-circle, we look at each other and we play, and we either get it or we don’t. And if we don’t get it we try it again until we have a good recording of what we’re trying to do. So I think it is missing from a lot of today’s music too so what you are getting is really a good recording of us playing this stuff live. Now I’ll go back on there and I’ll throw on a rhythm guitar track or a harmony vocal or a harmonica solo or something, but the basis of it all is us playing this stuff live. Z: I’ve never seen you live, but you’re coming to my neck of the woods on June 6th so I’m looking forward to getting the chance to hopefully check out your live show. Z: I’m in Moline, IL right across the river from Davenport, IA. I’m hoping to check out that show. WT: So is that the Red Stone Room? WT: Yeah that’s a great venue man. See if you can make that gig, that’ll be a good one. Z: What can fans expect from your live show? WT: Well they’re gonna, on this tour, we’re gonna play mainly songs off the new record which I’m really looking forward to because part of the writing process of this record was to write songs that we could do live, we could recreate that live, so they’re gonna hear a lot of the new stuff, and you know, it’s a pretty high energy kind of steam roller blues rock band, you know? Z: Does your song writing process vary from song to song or album to album or is it pretty much standard? WT: You know, I don’t even have a process, and I’ve done 21 albums now, originals, but there is not sort of process to it. I go at it very haphazardly. I’ll either have a little musical idea or I’ll have a line of lyric or I’ll have a little of both. I liken it to kind of putting together a jigsaw puzzle. I’ll have these little pieces and I kind of fit them together. Sometimes a song will take 5 minutes to write, sometimes it’ll take years. Sometimes it will be bouncing around in my head for literally 20 or 30 years and all of a sudden it will just come out. So you just have to wait, and it’s almost like these songs are just presented to you. You open up and you wait for the song and boom all of a sudden there it is. Z: You mentioned a jigsaw puzzle, from my vantage point it seems like the hardest part is sitting down to start the jigsaw puzzle. Do you need to be inspired or what gets you going to start writing? WT: Well I can tell you that, my wife manages my career and has for years, and does a great job. But I’ll go out and do a tour and I’ll tour for 8 months and I’ll get home and I’ll sit down for a couple of weeks, and then she’ll say “okay, hey man, you’re in the studio in the month, you’re making a new record in a month.” And I look at her and say “yeah what about it?” And she goes “what are you gonna record?” And I go “oh geez.” And at first I go through a day or two where I think can I do this again? I don’t know if I can do this again. I don’t know if I have anything more to say, if I have any more notes to play. Oh that rhymes, there’s a song right there. Nothing left to say, no more notes to play. We got a new song there man! Anyway, I swear I will all of a sudden I hear the voice of my long dead mom, and she says “hey Walter, you wanted to be a musician when you were a little kid, you really wanted it bad. Now you’re a musician, just go make some music, it’s not that rough,” and all of a sudden I get a whole different view of it, like “wait a minute, this is what I do. This is what I’ve done for over 40 years is make music. So just go make some music.” And all of a sudden it seems like it’s not a big deal at all, and then it just starts pouring out me, but I have to get to that point you know? Z: You’ve been around a long time. Technology in the music industry has changed a lot, you’ve seen a lot happen. How have those changes affected your process? WT: Well you know I’m still using a guitar and an amplifier. I don’t even use floor pedals so I’m a real old school guy. I take the guitar, I plug it into the amp, and I turn the amp way up, and that’s it. If you come to see my band, you’ll see other guys they have these big pedal boards full of stuff at their feet. I don’t have any of that, so it hasn’t really affected me at all. I’m still using a Mesa boogie amp. I’ve used Mason boogie amps for 30 years. I’m still using a Fender strap, and I just plug in and here I go. Now as far as recording, you know, I used to record on 24 track tape, now we do it on pro-tools on a computer, but other than that as far as what I do, the guitar playing, I haven’t changed it at all. Z: Who are some of the guitar players that you’re into now days? WT: I still listen to the guys that inspired me when I started. The Jimi Hendrix, or Eric Clapton, Buddy Guy, or Roy Buchanan, those are still the guys I like to listen to because they inspired me as a kid, and I still get that inspiration out of them. So I’m kind of an old school guy and I go back to the old guys from my youth.